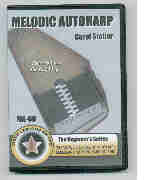 Take autoharp lessons in the comfort of your home with an autoharp DVD from PlayBetterBluegrass.com. Every Autoharp lesson DVD is discount priced and most titles ship the same day. The Autoharp was made famous by Mother Maybelle and Sara Carter. We saw a real surge in the interest in the Autoharp after the Johnny Cash Movie, Walk The Line, which featured June Carter Cash playing autoharp in several segments. Bryan Bowers, widely regarded as the leading autoharp virtuoso, breaks down his techniques on advanced songs and styles. He teaches thumb lead with index finger backstroke; good accompaniment; and how to find the melody and add harmony parts. 85-MINUTE DVD LEVEL 2. If you would like to play the melodies of favorite songs on the autoharp, this video is for you! Using traditional country songs, autoharp master Carol Stober takes you step-by-step from basic accompaniment patterns to advanced melodic solos. Includes ear-training tips as well as tablature and notes.